Cook, Jocelynn L. Green, Courtney R. de la Ronde, Sandra Dell, Colleen A. Graves, Lisa Morgan, Lisa Ordean, Alice Ruiter, James Steeves, Megan and Wong, Suzanne 2017. Screening and Management of Substance Use in Pregnancy: A Review. Journal of Obstetrics and Gynaecology Canada, Vol. 39, Issue. 10, p. 897. Jarlenski, Marian P. Chisolm, Margaret S. Kachur, Sarah Neale, Donna M. and Bennett, Wendy L. 2015. Use of Pharmacotherapies for Smoking Cessation. American Journal of Preventive Medicine, Vol. 48, Issue. 5, p. 528. Coleman, T., Chamberlain, C., Davey, M.A., Cooper, S.E.Leonardi-Bee, J. 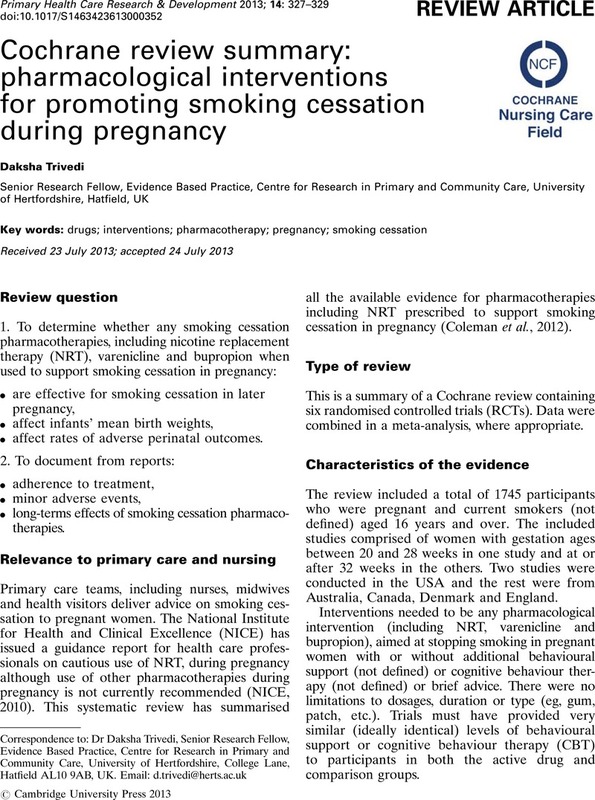 2012: Pharmacological interventions for promoting smoking cessation during pregnancy. Cochrane Database of Systematic Reviews, Issue 9. Art. no. : CD010078. Doi: 10.1002/14651858.CD010078.